Industrial cold rooms and refrigeration systems (like blast chillers for food products, refrigerated cabinets for supermarkets, butchers and fishmongers and cold rooms for catering businesses) are essential to preserving the freshness and flavour of foods. These systems are extremely complicated and require specially qualified technicians to maintain and repair them. For this reason the people who deal with freezers, cold rooms and refrigerated displays are generally professionals employed by specialist companies that provide installation, servicing and repair services. Most of the jobs of the refrigeration technician have to be done in shops, food processing plants, catering kitchens and food retailers, so a van is essential to carry all the necessary tools and materials. It’s even better if the van in question is properly upfitted to organise and exploit every inch of space and to ensure that there is a place for everything, from the smallest screwdriver tool to the bulkiest accessory. The specialists at Syncro System installation centres in Italy, Europe and countries around the world, can upfit all makes and models of van, and are happy to advise industrial refrigeration technicians how to create a super-functional racking system for their own needs. 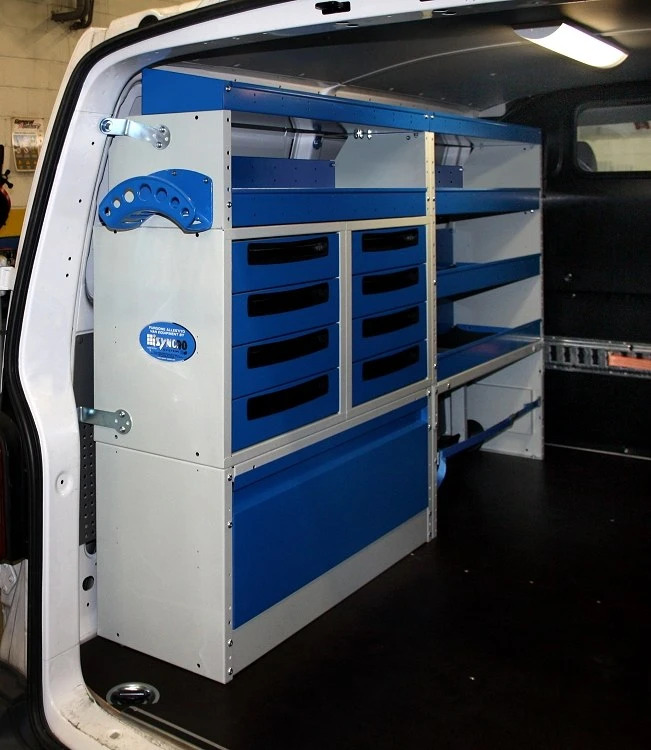 Syncro’s ingenious and highly effective solutions can transform a simple van into a mobile workshop for servicing even the most complex refrigeration system. The Syncro Group has almost two decades of experience in van racking and has proved on many occasions that a tidy and properly equipped load compartment can save a great deal of time and money for professionals who work on the move. Being able to put your hands on all the components, screwdrivers, spanners, cables and spares you need in a matter of seconds means saving precious time (as much as a quarter of an hour) otherwise spent hunting around in a cluttered load compartment. And being able to rely on storage units, component cases and accessories customised to meet your needs improves the quality of your work, gives you a more professional image and raises safety standards too. Any technician in the field of industrial refrigeration is certain to appreciate all these advantages. Syncro System has all the knowhow of a world leader in van racking and boasts a vast range of modular racking units. Syncro products can be combined in so many different ways to create personalised upfits for single vans or fleets. They are even easy to swap around. 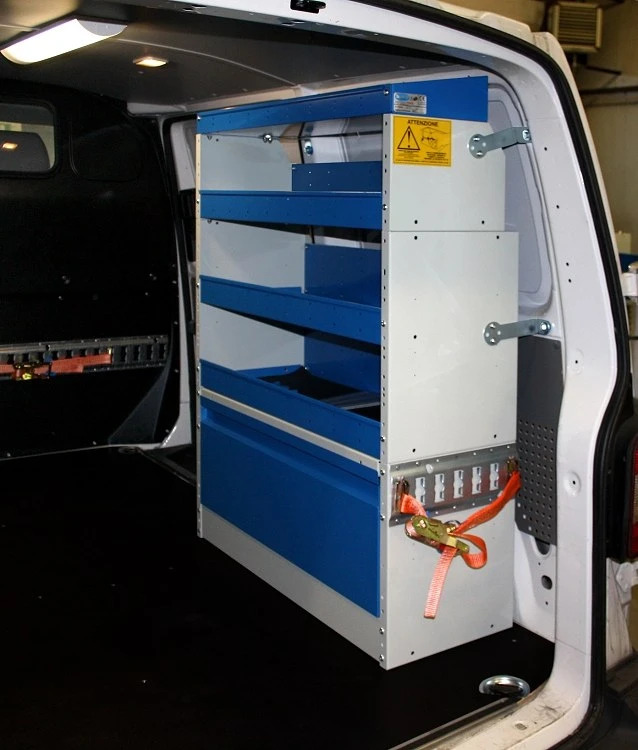 The photos reproduced above show a VolkswagenTransporter fitted with shelving and drawers arranged to meet the needs of industrial refrigeration technicians . 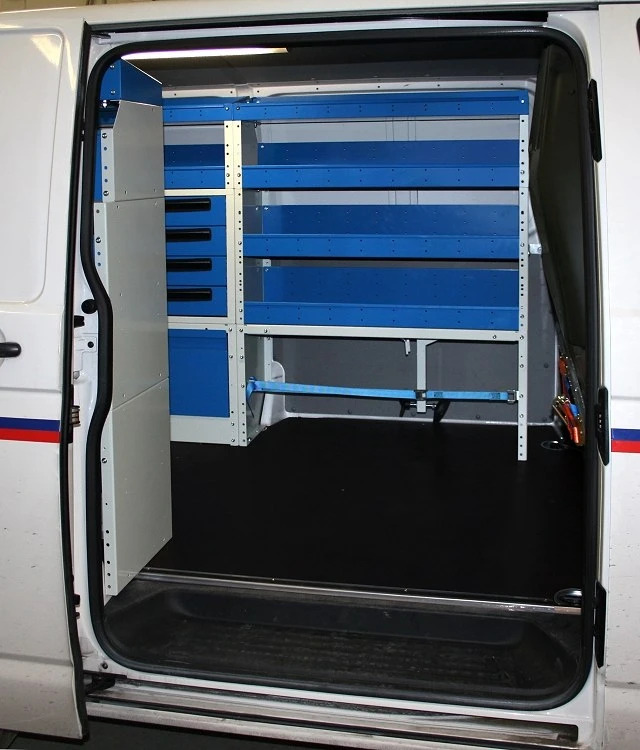 This storage system was designed by Syncro System’s specialist personnel to match the requirements of the van’s users and to maximise available space. 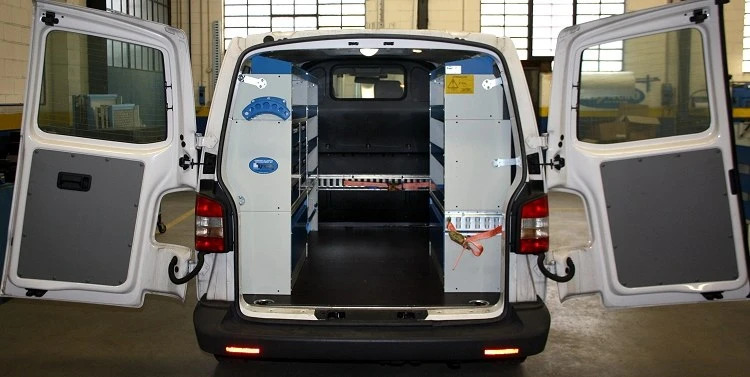 As Syncro System always does, before the racking as such was installed, the inside of the load compartment was protected and reinforced with linings on the rear doors, side walls and floor . This important step not prevents accidental damage to the bodywork but also provides surfaces strong enough to support the racking. To eliminate the risk of bends and dents, the floor was covered in a robust, marine grade, plywood panel with a non-slip resinated surface, while the doors, side walls and bulkhead were lined with cut-to-size panelling. Both sides of the van were then equipped with two blocks of cabinets. At the bottom on the left, we can see a wheel arch cabinet with a metal door and a second, open wheel arch unit equipped with cargo lashing straps. Higher up are levels of shelving for tool storage and a drawer unit with large metal drawers. The racking on the right side consists of a closed wheel arch cabinet and four levels of shelves. The bulkhead is equipped with a rail and lashing straps for securing compressors or other bulky equipment or cargo in complete safety. A similar but shorter rail is installed on the right, while the left racking is fitted with a practical cable holder.